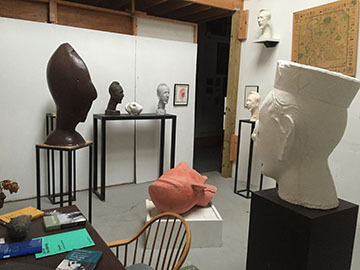 This grouping of sculpture is subject to various interpretations. A “most likely” interpretation will be presented followed by an alternative, though less likely, scenario. Choice is good. However, in spite of what has been previously stated, this alternative interpretation is not to be seen as not having some legitimacy. It is left in the viewer’s hands to make the choice here. Read the Full "Rochergtorium: An Orientation"
The Rochbergtorium is a paen to the great American composer George Rochberg (1918-2005). The Rochbergtorium takes the form of a Roman lararium. Larariums were small rooms in the Roman household where statues of various gods were displayed. The householders would worship in these rooms. 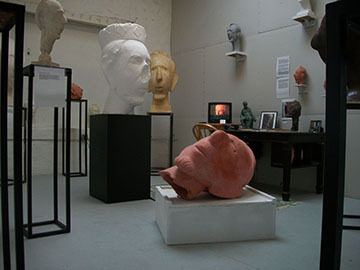 The Rochbertorium takes shape with numerous “portraits” or relics of the artist assembled from various quarters. This “gathering” has taken place over the last fifteen years by a little known independent curator. The Rochbergtorium is currently partially although mostly finished. The Rochbergtorium can be seen as a devotional to an artistic friendship. Rochberg and Cairns were “companions”—in the old sense of the word. 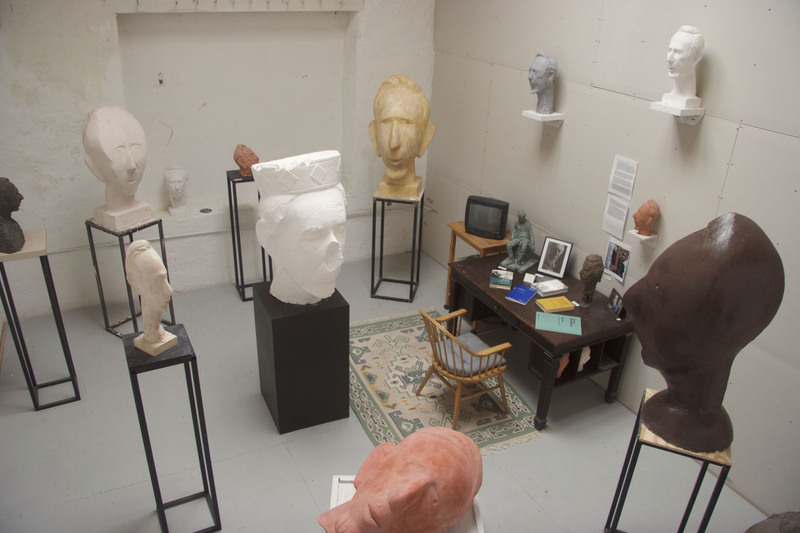 Various heads of various sizes and various styles and various materials fill the chamber. Other personal artifacts inhabit the space. Each sculpture forms a reminiscence of or interface with this great artist and the art of the past, sometimes the distant past. In its particulars the Rochbergtorium uses the motif of Rochberg to build a devotional to sculpture, to the interaction of sculpture and music, and to artistic friendship. Included in the chamber is a 12-minute video interview of Rochberg, made by Peter Cairns. Rochberg’s Caprice Variations are heard in the chamber, in an exquisite recording of Peter Sheppard-Skaervard. An unnamed sculpture teacher at HC assigned her beginning students a task—what is known as an “assignment”. 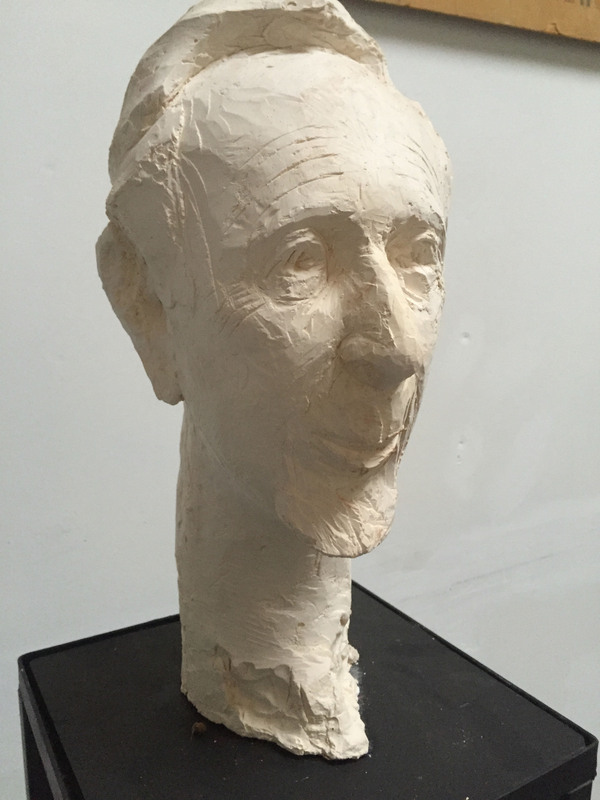 Working from old photographs of Rochberg, the students were encouraged to make a sculpture of the composer. 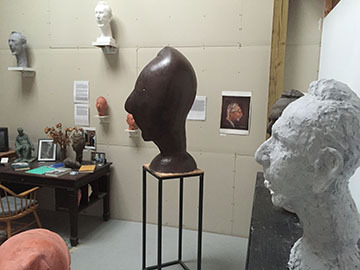 Over a long weekend, each student, working hard (as is their habit), made a sculptural head. These sculptures are the product of that enterprise. The diversity of students’ work explains clearly the diversity of approach. 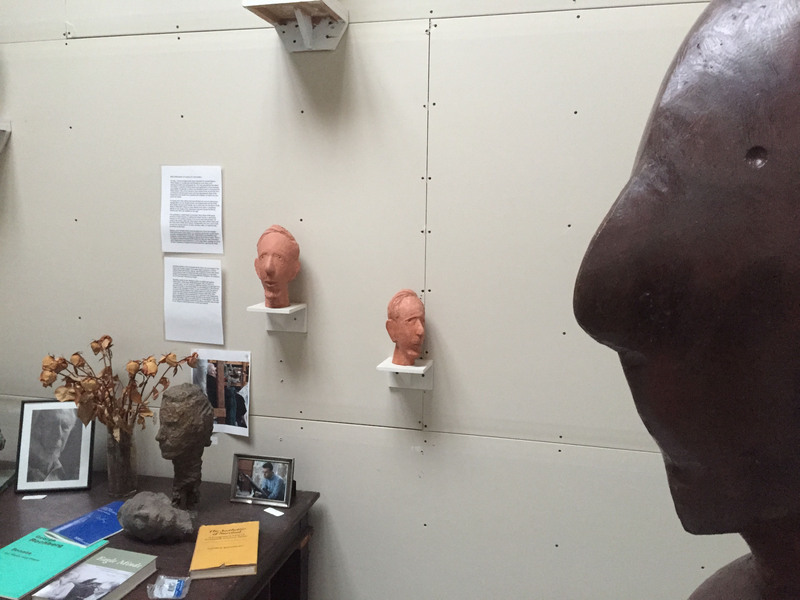 The sculptures are arranged as the teacher had wanted—in order to highlight (for administrators) her skills at teaching. Unfortunately, she was not retained in the sculpture position, but not necessarily as a result of this project. Some of the sculptures have attributions and descriptions. Others do not. This is not to be seen in any way as prejudicial to those sculptures that do not have “signage”. It is just that information about certain of the sculptures is unavailable at this time. It has nothing to do with the aesthetic nature of the sculpture, and additional signage will be attached to the pieces as information about them emerges. You can be assured of that. Additionally government stimulus/bailout money has been sought to make an audio tour of the show. Recent text messages, received directly from Obama, have indicated that likelihood that such funding will be available—although no firm promises have been made. On several occasions this head has been referred to as a Marini head, or Marina head or Marina’s head. Much research has gone into trying to determine what this means or might mean. Certainly the sculpture could not be of a Marina, as it is not a woman’s head, or at least does not appear to be a woman’s head. Perhaps the owner at a certain time was a Marina and in this fashion it was referred to as “Marina’s head.” Is that possible? Yes, it is possible—but not likely. Arguing on the other side is the idea that there are many women named Marina, or at least, there used to be. 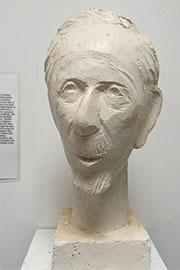 More likely, the head was sculpted by a certain Marini. In looking at the literature of sculpture, one finds that there was indeed an Italian sculptor named Marini, and a quite famous sculptor he was indeed, at least during his lifetime, if not even after. He even has his own museum, in Florence of all places. 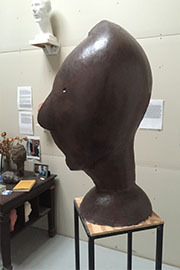 On close examination of the head—nuance, texture, handling of the material, the material itself, pose and reflection, general ambiance, as well as specific markings—this researcher, after great reflection and study, puts it in this category of a Marini head, perhaps made in the 1950s. Is it possible that Rochberg sat for Marini? Yes, it is possible. Rochberg spent a few years in the 1950s in Rome and could have known Marini at this time, although no documentation remains or exists of a relationship. At the present time current research and diagnostics allow us to be no more secure in this assessment than this, and we will have to wait for technological advances in analysis of materials and treatment in order to come to a definitive assessment. In the meantime we can enjoy the sculpture itself, resting assured that it was created by a fine artist, in fact a very talented artist, whether that be Marini, Marina or someone else. The sculpture is decidedly one sided or “flat”, as they say. In other words, the physical space of the sculpture is shallow. 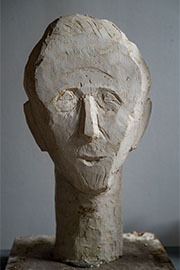 Various artists have worked in this fashion, particularly Medardo Rosso and later Alberto Giacometti. While working in this manner is not a new idea, it is also not an old idea. So you can feel free to make up your own mind here. One sees a flattening out of the form and a lack of depth almost as if it were a painting. What is happening here? Does the artist have a vision problem? On the other hand, perhaps this all serves a purpose? Art is a deep mystery and one might as well start now—wondering. The literal minded might ask—could Rochberg have been this squished, this scrunched? The answer is probably not—certainly not. Another perceptive question would revolve around the date of the sculpture. This date is hard to believe. In 1935 Rochberg was 16 years old. Does this look like a 16 year old? Maybe the curator should change the date to something more reasonable. The idea of having to look at a piece of sculpture from one primary point of view is slightly irritating to this curator and perhaps you agree? For instance this curator believes that sculpture should be able to be viewed from all around without encumbrance to the viewer. His idea is that the viewer should be able to interact with the sculpture as a whole and be able to participate with it on his or her own terms without the imposition or oppression of the other. Don’t you agree? Please say yes. In recent years his culture has been divided into several subsections. Among them are the Wamba heads, the Sokota heads, and the NOK-ROC heads. 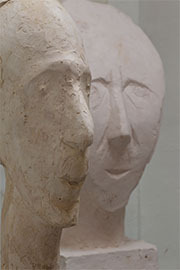 Several small heads, one of which has the inscription NOK-ROK or NOK-ROC (there is some dispute here) show a surprising affinity to the visage of the American composer George Rochberg. Which came first, the chicken or the egg? The question is, could these be portraits? 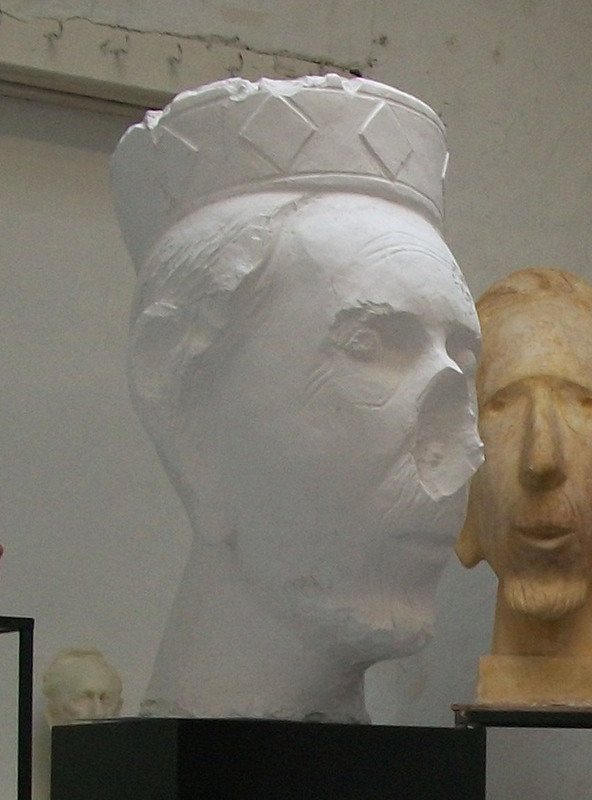 Were these NOK heads portraits of their leaders or cultural favorites? So far, a conclusion escapes us, but modern science is hot on the trail and perhaps will come to the rescue. After all, these pieces have been carbon dated and the NOK-ROK (NOK-ROC) heads, indisputably (for sure), were made around the second century. In fact, one has a date, or a partial date, inscribed on the back. Nearby, a few hundred feet, from the discovery of the two smaller NOK-ROK heads (seen nearby on a shelf) was found a much larger, partially damaged (aren’t they all?) 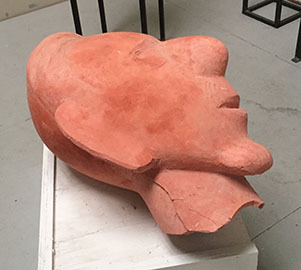 NOK-ROK HEAD (reddish clay sculpture on low base). It measures almost three feet in height. This is the largest of the terracotta NOK heads that has ever been unearthed and it must have been attached to a very large figure, perhaps as tall as 18 feet! Professor el Mamit of the local museum says that the high selenium content in the soil preserved the head. Can you imagine? The head is all that remains of the entire figure except for a curious artifact found half-buried close by. This fragment of terra cotta seems to be a hand or part of a hand from this same figure. It is obviously broken and the gesture is somewhat difficult to decipher. We present it for your perusal. What do you think? Standing nearby in this exhibition hall is an additional modern “fabrication” of the larger ROK-NOK heads. This, in itself, is a “curiosity piece”. It was made by a different sculptor, but perhaps from the same school. It was found either in the basement of the Museum of Man in the Trocadero in Paris, or was recovered from the ruins of the burnt Vijecnica library (the surface seems to be burnt). Please notice that this modern reconstruction lacks the craft of the older pieces. In addition the reconstruction is deficient in the imagination and rendering that comes flowing naturally by the authors in the real ROK-NOK pieces. Here is an instruction in “verisimilitude”. This tells us a lot about the modern world and its values, and of the loss of craft in art. There is a lot to learn here—so let’s get started! Various Atoner heads still exist in the real world in such places as Secaucus NJ and Ashbury Park, the birthplace of Bruce Springsteen. Marvel at the one here of George Rochberg, expressing the most exquisite sensitivity. We are left to ponder the idea: Is it real? The answer can easily be provided: Yes, this is real. This head was found in a rune not so long ago. It was felt to be a portrait of a leader or a priest or even a God. Can you believe it? Additional research concludes that it is St. Roch, a patron saint of early Celtic druids. (It is a very primitive looking sculpture, although it has survived for a long time and is perhaps the oldest piece in the chamber, excepting the Nok/Rok heads). At the time the Celts were painting themselves blue and dancing around fires, making ritualistic sacrifices, some of which can be seen depicted in other parts of this “museum,” at the very same time Rochberg’s real ancestors were building the Temple of Solomon. 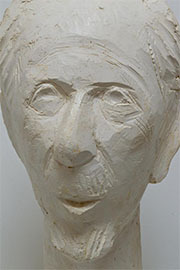 Although seriously ill, Alberto Giacometti visited NY in 1965 for his show at MOMA. Surprisingly he made a quick visit to UPenn (popped down to Philadelphia) and did a head of Rochberg. Rochberg, at the time, was chairman of the Music Department. Perhaps, at the time, Rochberg was seen as an apt subject. Giacometti brought his own clay. The piece was finished in one sitting. 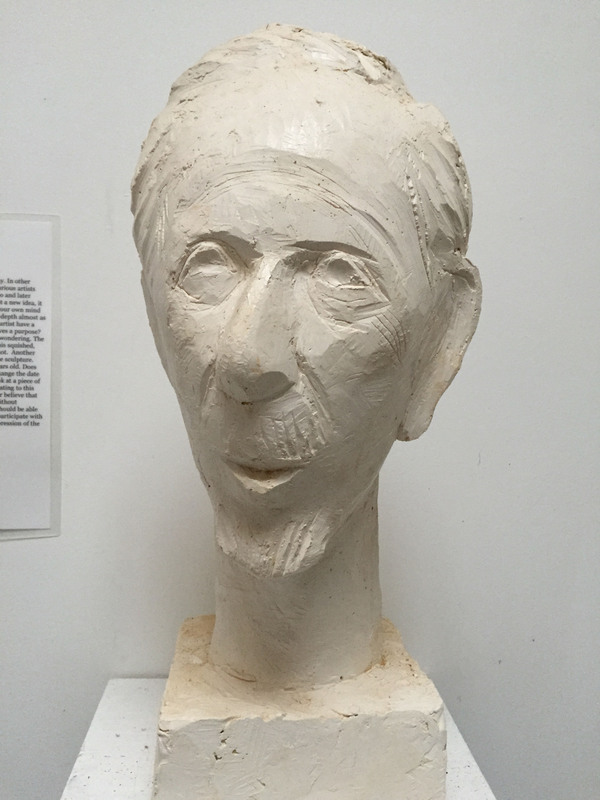 It was the only time that Giacometti felt that he had ever completely captured a subject. Once finished, the clay was left wrapped up on an armature for some time. 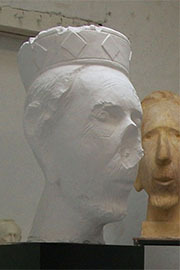 Eventually, a sculpture student of Robert Engman made a plaster mold of the piece. 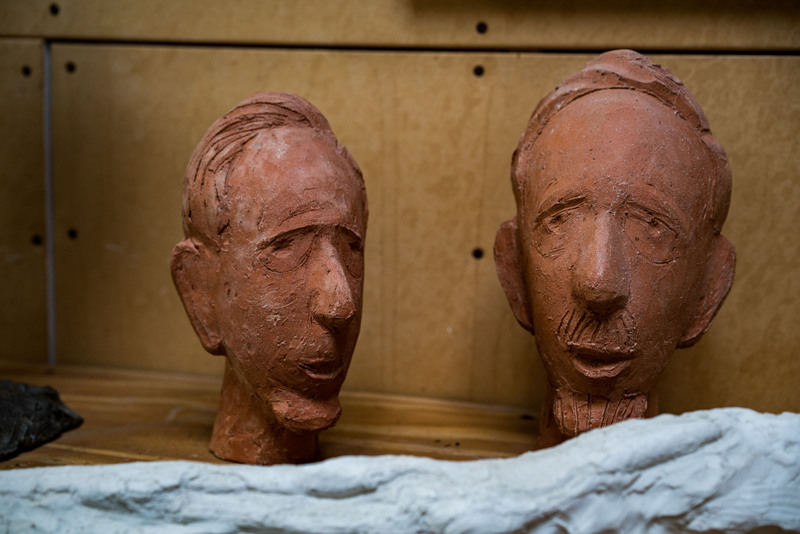 The mold lay around the art department for many years covered with trash and dust. It was finally found in 1978 by a graduate student named Scott Sherk. Scott had been a student of Cairns at Haverford College and thus was trained to be receptive to such a mold. In other words, Sherk recognized this as something of interest, as opposed to the other M.F.A. students, who were dolts. Cairns was teaching at Haverford at the time, but no more. Scott showed the mold Cairns and it was cast in 1979. At that time, I had no idea who Rochberg was. Later he became my friend. I think Mr. Sherk has a cast of this piece also, but I am unclear on this point. A cursory check of the UPenn’s student paper, The Daily Pennsylvanian, reveals an interesting detail. In an April 1965 edition (the same month as the Giacometti show in NY) there was a small entry about a small curly-headed Frenchman giving an impromtu lecture to a few passing students. This man stood on the steps of the Furness Library, what was then the art building. This elderly gentleman, bent with age, was gabbering on in French, which only a few could understand. He appeared to be very nervous and was smoking like a chimney. This appears to be Giacometti himself. What do you think? I first conceived of the Rochbergtorium many years ago. 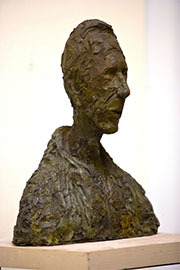 I worked on some heads of George for years, never really getting anywhere. These heads sucked up a huge amount of my time. I thought of them as completely unsuccessful. Once in a while I would strike a note that seemed real to me. Rochberg was such a funny looking duck. He also had a very powerful presence. The combination was deadly to me as I tried to work my way towards a head that had some meaning. Once or twice or three times I was satisfied with a head and would keep it as a final head. 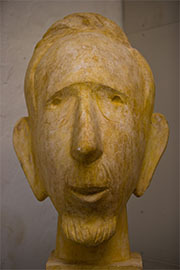 Bruce Gagnier liked one particularly, a head of George with a beard, which I modeled and carved with a razor knife. The head is of a happy soul, a person with an inner optimism. 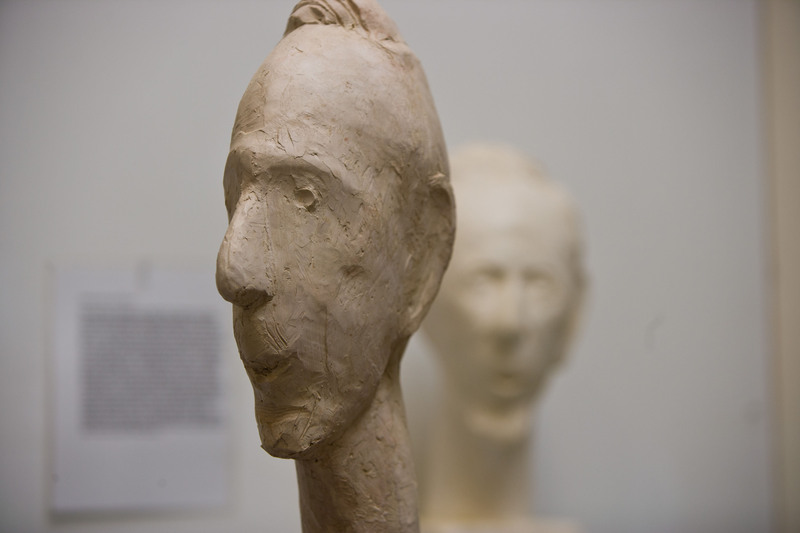 Some of the time I would work directly in clay, some of the time I would work in plaster with a razor knife, slicing. After a while, after a few years, I gave up on these heads and put them on a shelf. Occasionally I would start up on one and then the cycle would begin again. Eventually I made two or three, particularly two heads, that caught some of Rochberg’s ferocity. Later I started a larger head, hoping to make a grander spectacle. A few people would see these heads when I would have my Winter Party. Scott commented on the big head one year. It sat there partially resolved for many years and I would work on it intermittently, without results. All this was fairly depressing. I am an artist who is used to doing things that are going forward. I may work for a long time on something, often not finishing it, but I am not used to going in circles. I was in range of being defeated by this project, this idea of making a portrait of Rochberg. Somewhere I had the idea that this sculptural project was going to be good for me. I was venturing into an area that was not familiar to me and which previously I had had no interest. I thought that by accepting this discipline and working repeatedly on a single head, in variations, that I would learn something. I worked diligently, but I do not know if I did learn anything. This project sucked up a whole bunch of time,. And always I was left with and unsettled felling. Almost from the beginning I had the idea of making a Rochbergtorium, a room that would present a number of head of the composer. As I worked along I accumulated a few pieces, mostly small that I felt might be deserving of being in the Rochbergtorium. I cast a few in bronze. Later I cut up a few of these bronzes and started over. My interest in the Rochbergtorium resurfaced in the spring of 2005. It had been several years since I worked on these heads. It had been several years since I worked on much of anything. I had a show at Haverford in 2002, where I put together another long term project, the grouping of eleven figures called Wieviel Stucke?. This time, in 2005, the path for my show was again clear. I was going to show pieces that had languished in my Haverford studio for many years. I would also throw in some bronzes in hopes of selling to some people. After all , it was the end of my career at Haverford and there might be some sentiment for buying my pieces. This turned out to not be true. At some point the obvious occurred to me. Rochberg was getting older and had recently been in and out of the hospital. I wondered how long he was going to live, and I thought abut my Rochbergtorium. I decided about a month prior to the April show to put together a partial version f the Rochbergtorium. I selected several plaster heads, one older wax and three bronzes. I also began work in earnest on the large plaster head, in hopes of getting it in shape to show. 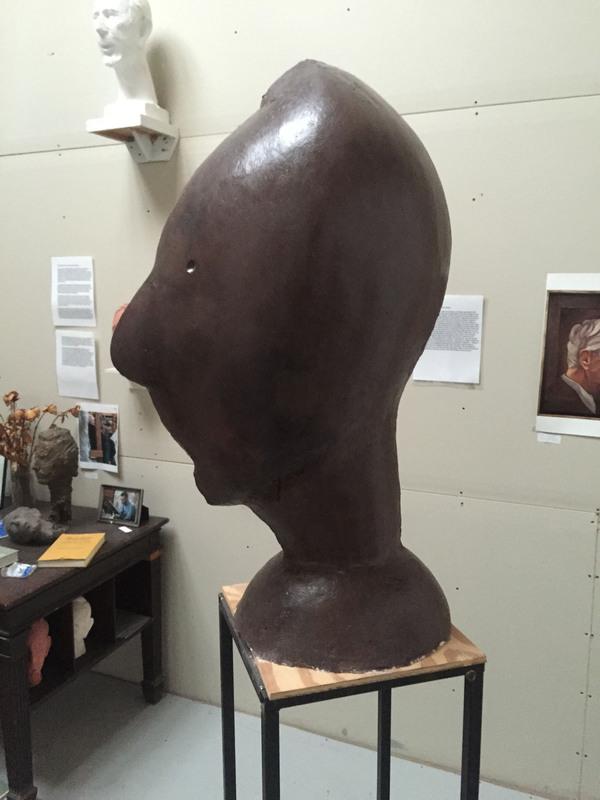 Every day I worked hard on this head, believing that I was making progress. I was under the delusion here. About a week prior to the show I stopped working on this big head, deciding to show it as it was. I felt that I would continue on it later, after the show. Why did this concert ever happen? Rochberg music is showcased in Weill Hall and a bunch of losers musicians present his music. Is this a lousy idea or what? Someone is not too smart. The idea would be to show up in NY or elsewhere and present a knock concert of his work. Rochberg had to listen to enough shitheads performing his work. Why continue this after his death? – and sanction it in the bargain? I have heard many very gifted musicians play his work. Tony Barone, Peter Sheppard, Elliot Fisk and many others. Why not have a concert of musicians who can actually play his work and thrust it foreword. I guess this is a set up for my Rochbergtorium, travailing circus show. For instance the Rochbergtorium is a last minute patchwork. I think it is a fine idea, but it is essentially unrealized. Whether it ever get further remains to be seen. I came up with the idea of putting together the Rochbergtorium at Haverford because I was afraid that soon it would be too late. I got that right. When Peter S-S heard that I did this, he was irritated, saying that he would have come and played the Variations in the chamber. This guy is crazy enough to have done this, and I wish that I had thought of it. I had enough problems though, just getting this plaster work together. I have a semi-low station in life. Consequently this kind of situation comes up all the time. I can barely take care of myself. The Rochbergs visited my show on Saturday April 9. They were surprised and pleased with the Rochbergtorium. I brought in a second chair so they could both sit. They sat for a long time, soaking it up. George put on the headphones and listened to Peter’s interview of him. He laughed and laughed. At the end he said that this guy (being interviewed) is really terrific, that he has it all right. He said that it was the first person with whom he agreed completely. They enjoyed my written statement, and Gene asked for a copy. Later I sat with Gene alone in the Rochbergtorium. I pointed out a head of George that I liked, one of the very first that I did. I had done it from photos of him in the fifties, in other words, from when he was a young man. Gene was not particularly inclined towards this head. She pointed to several others that she liked. I was skeptical, as usual, as to how much she can actually see. She went on to say that Rochberg was a plain looking man when he was young. She repeated an idea of Camus. He said that, up to 40, you have the face with which you are born, but, after 40, you make your own face. I am working along on my Rochberg pieces. I have made a few Roch-heads and have a few more to make. I have made on Rok-Nok and also I have a few more of this to make. I have made three Rochiacometti heads and want to make one or two more. Then I have started on a Rochatoner head. I have plans to do some others, although I do not remember right now. These pieces come as they must, episodically. I don’t do the bidding here, I only respond as the voices speak up to me out of my sculptural past. The obsessive and the rational. Mesopotamia, Palmyra, these are ideas too. I walk along the streets of NY thinking about my hieratic Rochberg head, a combo of Easter Island and Palmyran sculpture. I was on the second floor of the British Museum today. I saw a bunch of old friends as I walked aimlessly from room to room. I saw pieces from Mesopotamia, Palmyra, Ain Ghazel, prehistory –like that. I went and looked at books and saw Bernard Fagg’s Nok Heads. I thought about eyes and ears- mostly eyes, and rocks – lots of rocks. Palmyran/Esherick? Where is my Esherick moldy mold? I work away in my studio on these Rochberg heads. As I work I laugh and laugh. All this is so funny. 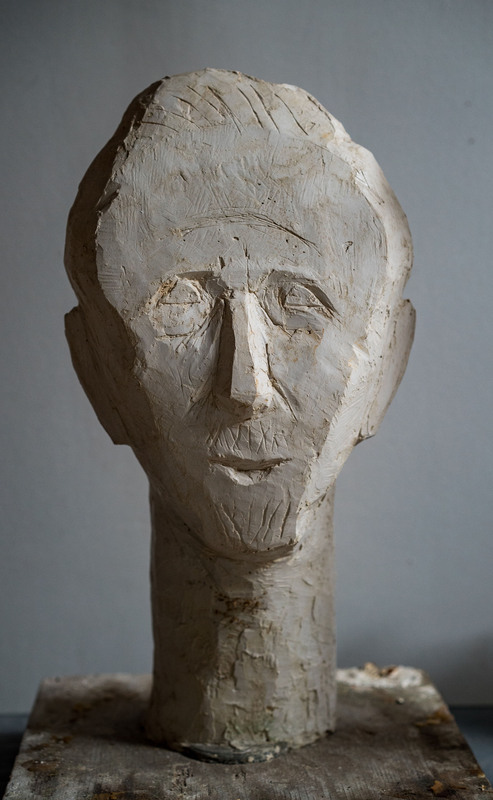 I am currently working on a little head of Rochberg in the style of Giacometti. I think about where this head came from. Like, I mean everything has an etymology right? For a few days I though of the sculpture on which I am working, the larger Rochberg head. Then I forgot about it. At other time I thought of my Celtic head, which Rick is making some copies for me. I thought of a variation that I want to make, which would make the piece deeper in length and more solid all around. I would still keep the curved flat front but narrow it and build the sides back and make it go round and strong over the top to the back. In this way maybe I can achieve an effect as if it were made by Picasso, at his best. I am convinced that working on these heads has an efficacious effect on me. 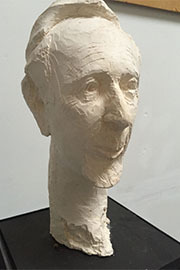 Rochberg over the past ten years, so I am and will enjoy making variations in different styles and studying these styles and ways of dong sculpture. One might surmise that this form of study comes at a very late date in my life, but who cares? No one is taking notes, that is for sure. I might as ell entertain myself as surely, no one else will be providing the entertainment.